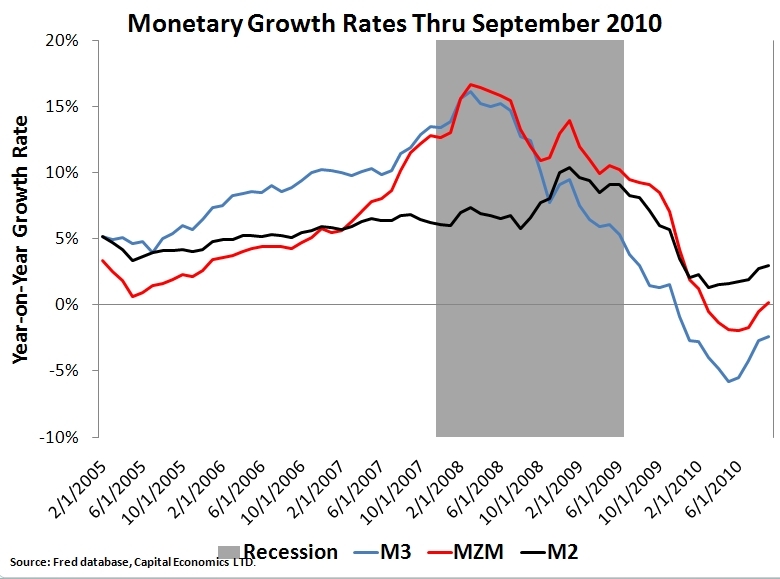 The growth rates of the monetary aggregates have been anything but stable. 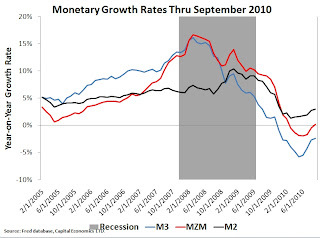 In fact, M3 and MZM--arguably better measures of money during this crisis than M2--have had a recent run of negative growth. 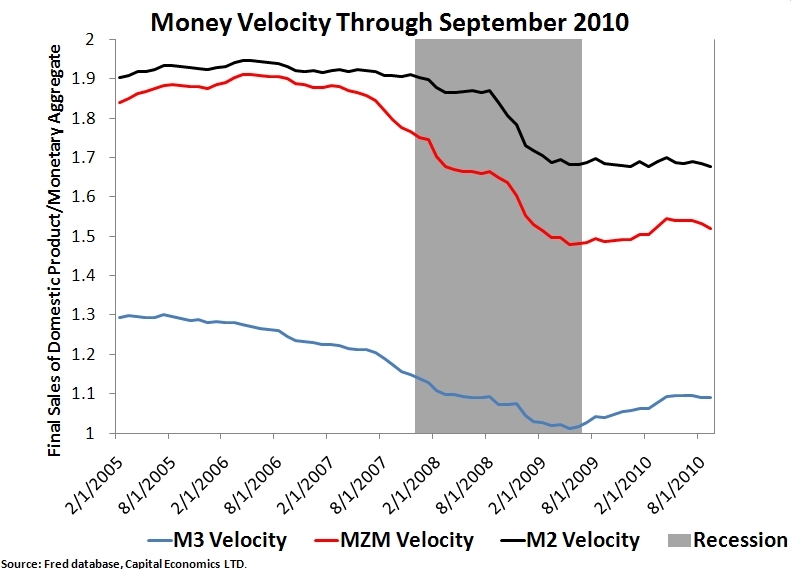 While M2 has had positive growth, it too appears below trend. All of them have seen plunges in their growth rates. Would Milton Friedman really look at this graph and conclude there has been monetary stability? Here again we see anything but stability. It is hard to believe that Friedman would not have been concerned by the pick up in money demand implied by this figure. Moreover, he would realize the that these figures together (i.e. %ΔM +%ΔV) indicate that the growth path of nominal income has not been stable either. This too would have concerned him. It is the first nominal anchor that has been suggested that seems to me to have real advantages over the nominal money supply. Clearly it is far better than a price level anchor which... is always backward looking. So Friedman endorses this approach by saying it trumps targeting the money supply. Now given that inflation expectations were headed down for most of the year (see here), it seems likely Friedman would be concerned on this front too. Only with the talk of QE2 in September did these expectations turn around. I suspect he would have been pleased. Whether the demand for money increases or the supply of money has decreases depends on how broadly 'money' is defined. Wherever one draws the line, there will always be some money-like asset not included, but which the supply and demand for are important for monetary policy. It seems that the supply of many money-like assets fell significantly in 2008. The unmet demand for these assets then spilled over into conventional monies. Therefore, whether one interprets events as an increase in money demand or decrease in money supply depends on broadly 'money' is defined. Friedman could not advocate monetary expansion under one interpretation and not the other and be consistent, because both interpretations are logically equivalent. However, it seems as though this is the argument your critics are trying to make. Check out Russell Roberts's EconTalk episode with Friedman in 2006. Go to 23:00 and listen to Friedman's 'favourite proposal'. In short, he wanted the supply of high powered money frozen. Friedman says it should be a constant: 'like gravity'. He explains that the ratio of high powered money to total money has been going up over time; the economy would create more money and roughly emulate a monetary growth rule. He mentions 'money demand' only once, much earlier in the podcast, and unfortunately stumbles over his words and appears somewhat confused. I believe he was trying to say: holding money demand constant, everything I say follows. But it is unclear exactly what he means. Lee, regarding your comment on the inherent difficulty in determining the correct measure of money I agree. That is why I used multiple measures of the money supply to show that the documented changes in them are robust to different measures. I would love to get feedback from folks like Jerry O'Driscoll and others luminaries at the Monetarist conference who did not like our Friedman piece or that of David Wessel in the WSJ. How do they grapple with the lack of stability shown in the money supply graphs or the Friedman quote at the end of the post? Seems to me that Friedman might say that while he wouldn't prefer *discretionary* monetary adjustments, he still prefers Greenspan's moves in the 90s to doing nothing, and that such adjustments are best for when we are in a more or less economically stable period of growth. A major recession due to a collapse in the financial sector resulting in a drop in V might not be the situation he had in mind for such adjustments. He might say "V dropped for a *reason*, and we shouldn't target monetary growth to get our graphs looking right because those graphs *should* look off, owing to the crisis." What needs to be understood, here, is that money exists with a supply/demand curve like any other resource. What is necessary is for the supply of money to match its demand, in order for pricing to not be distorted, allowing the economy to communicate optimally. 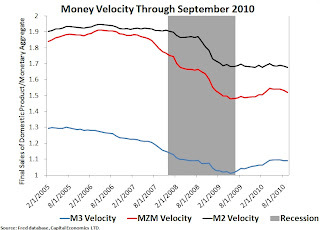 When money velocity declines, this alters the supply/demand curve (against supply) as much as if money quantity declined. Pricing is distorted by a shift in either direction, deflationary or inflationary. Both cause "malinvestment", blurring where real prices should be. Would FA Hayek Favor QE2? Oh No, QE2 Might Actually Work! A Defection from the "Open Letter to Bernanke"
Is There Any Hope for Improving the Fed? How Would QE II Help? Can We Get Some More Certainty, Please?